Every individual who have crossed major age should have PAN Card (Permanent Account Number) as it is mandatory document to be produced while doing financial transactions like opening bank account, applying for debit or credit card, fixed deposit, purchase or sale of vehicle, selling or buying property, making insurance payment, while purchasing jewelry etc. So today we will explain you how one can apply for PAN Card. Applying for PAN Card is very easy task you just need to fill the form correctly provide documents and passport size photograph and you are done. But today there are two ways with which you can apply for PAN Card i.e. online through website and Offline by visiting PAN Card Office. So first we will explain step by step procedure on How to Apply for PAN Card Online, but before you start you will have to keep ready scanned copies of documents required to apply for PAN Card. Below are the list of documents which includes Proof of Address, Proof of Identity, and Proof of Date of Birth acceptable to apply for PAN Card. Once you have these documents scanned copies you can carry following the next process to Apply for PAN Card Online. Just visit NSDL Portal by clicking here. Scroll down the website and from Apply for a new PAN Card option scroll down menu select Individual and click on select button. On clicking select button it will navigate you to Form No. 49A Application for Allotment of Permanent Account Number, so now you will have to fill the form correctly by entering valid details as per your documents. If you have any doubts or to avoid mistakes you can follow Instructions for Filling Form 49A and Guidelines for Filling Form 49A. The first field in the form AO Code, you can find your AO Code (Area Code) by clicking here or else you can even call Income Tax department helpline at 18001801961 to find out your AO Code. Next fill all the details like name, gender, DOB, address etc. but on the 15th step select the correct documents from the drop down list which you will be enclosing. Once you fill all the details select the payment method from Demand Draft, Cheque, Credit Card/ Debit Card, or Net Banking. You will be charged Rs.106/- as Fee for processing PAN Card Application plus applicable bank charges depending on payment method you select. Once you are done click on submit button, in the next screen you will be asked to review all the details which you have filled. Once you are confirmed that all entered details are correct just enter the captcha and click on confirm button. It will navigate you to payment terms and conditions. Note down the transaction number at the top of the page and click Agree and make the payment. On successful payment you will get acknowledgement form containing 15-digit acknowledgement number, print the acknowledgement form and attach two passport sized photograph in the space provided. Sign within the box on the acknowledgement form. Put the acknowledgement form into an envelope with document photocopies (duly self-attested) as mentioned. (If you have not paid online put cheque or DD in the envelope). Write “APPLICATION FOR PAN – Acknowledgement Number” On the envelope and send it to NSDL at Income Tax PAN Services Unit, NSDL e-Governance Infrastructure Limited, 5th floor, Mantri Sterling, Plot No. 341, Survey No. 997/8, Model Colony, Near Deep Bungalow Chowk, Pune – 411016. The application should reach NSDL within 15 days from the date of online application. And once NSDL processes your PAN Card Application the PAN Card will be delivered to your postal address. You can even check the status of your PAN Card Application by calling 02027218080. 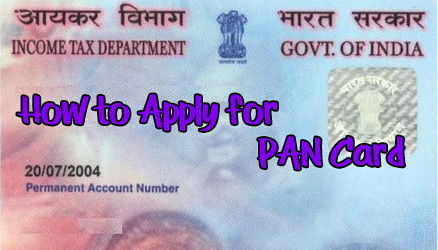 To Apply for PAN Card Offline you will have to fill the Form No. 49A Application for Allotment of Permanent Account Number with Black Ink Pen. Download Form No. 49A Application for Allotment of Permanent Account Number, take a print out and fill it carefully by entering valid details as per your documents or you can even obtain application forms from IT PAN Service Centers (managed by UTIITSL) or TIN-Facilitation Centers (TIN-FCs) / PAN Centers (managed by NSDL), or any other stationery vendor providing such forms. Once you have filled the form completely Affix Recent passport sized photograph and sign across the photo. With Form No. 49A Application for Allotment of Permanent Account Number enclose photo copies of Proof of Address, Proof of Identity and Proof of Date of Birth duly self-attested. Once you are done with the above steps submit the application form along with documents and fee for processing PAN application Rs.105/-(including service tax) through Demand Draft or Cash to UTITSL PAN Service Center. Once you submit the form to UTITSL Center you will receive an acknowledgment containing a unique number on acceptance of this form. This acknowledgement number can be used for tracking the status of the application.